This giant curling wave or shell if you like is reminiscent of Gaudi with its colourful mosaic design by Zurab Tsereteli. 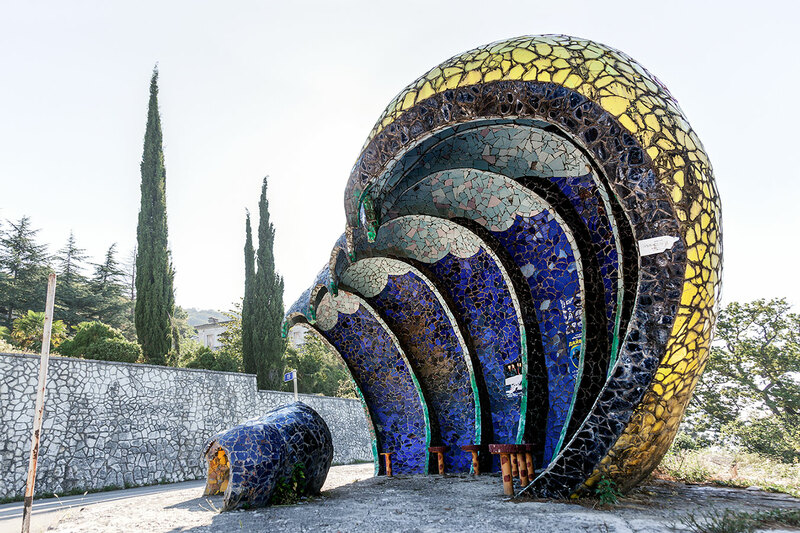 What makes this bus shelter even more distinctive is its location on the side of the road in Abkhazia, Georgia. The bus stop is one of 150 snapped by Canadian photographer Christopher Herwig as he travelled through the former Soviet Union over 12 years, capturing these unique structures for his book Soviet Bus Stops. Most were achieved through various jobs sending him around the area but others were sought-out; becoming an adventure for both himself and occasionally the taxi driver who would become entranced by his bus stop mission.